Add broccoli, onion, chicken bouillon, water, olive oil and pepper to a medium frying pan. Cook covered for about 10 minutes. Stir occasionally. 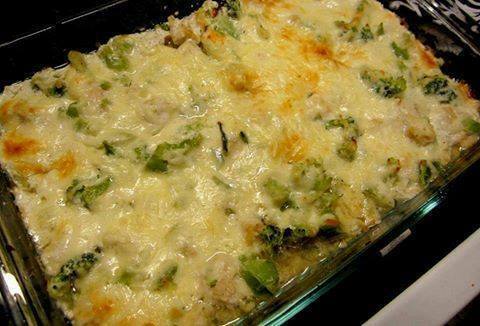 In a medium bowl mix the chicken chunks, garlic powder, sour cream and ricotta cheese together. Mix till blended. After 10 minutes of cooking the veggies, pour the broccoli mix into the bowl with the chicken. Stir until blended. Add 1/4 c of the shredded mozzarella cheese to the mix. Stir. Transfer your mix to the greased pan and spread evenly. Add the remaining mozzarella cheese to the top and pop that baby in the oven! Bake at 350 degrees for 50 – 60 minutes. Once the top layer of cheese is browned a bit it should be done. If you like your broccoli on the softer side bake until the florets are to your liking.